Description: This set includes a small orange and yellow dump truck and an Original Little People construction worker. The dump truck has "spring-loaded action" with a tilting bucket on the back. The tireless construction worker (green or light blue body) wears a crome-like construction helmet. FPT421 - Orange 1-seat dump truck with a Yellow spring-loaded bucket on the back that tilts. Rolls on 4 black knobby wheels. UPP - Light blue construction worker with a moustache wearing a silver construction helmet and an orange scarf. BVPP - This set could have also used a green construction worker with a silver construction helmet, orange scarf, and no moustache. This set was sold in a 5" x 2-11/16" x 6-7/16 display box. This set was also sold in #398 Fisher-Price Little Trucks. 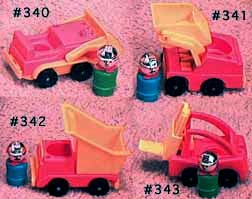 There was a set of construction vehicles made in the early 1990's (#5641) that has a dump truck the exact same size and shape as the one used in this set. The bulldozer used in #5641, however, had no hole for the Little People figure to sit in and the wheels are blue. The #5641 is often confused as a "oops" Little People vehicle.